This has been making the rounds of all the mailing lists, so chances are some of you have seen it, but it’s still well worth sharing. Eagles Impress Animal Lovers? Not this one. Private, spirited, cordial and candid. 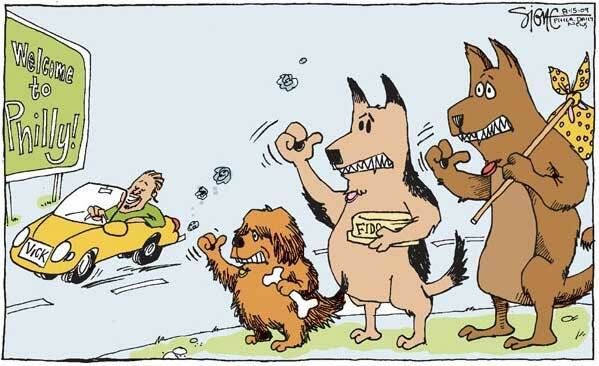 That’s how devout animal lovers described their two-hour meeting Monday night with Eagles management. “I thought it was a good first step in making the best of what we all think is kind of a horrific starting situation,” said Rich Britton, with Chester County’s SPCA. The team extended the invites, reaching out to representatives of the area’s animal welfare groups, one week after signing dogfighting felonMichael Vick. Vick was not at the meeting (since he’s not part of the management team) but Eagles President Joe Banner was and that seemed to buy a lot of goodwill. “I have to give the Eagles high marks, that Mr. Banner and Ms. Crawley were prepared to sit there as long as they did,” said District Attorney Lynne Abraham. She was invited by the team to lend a “prosecutor’s perspective” to the discussion. You know what? Color me unimpressed. The only “good first step” that these morons can possibly make is when they start the firing process. 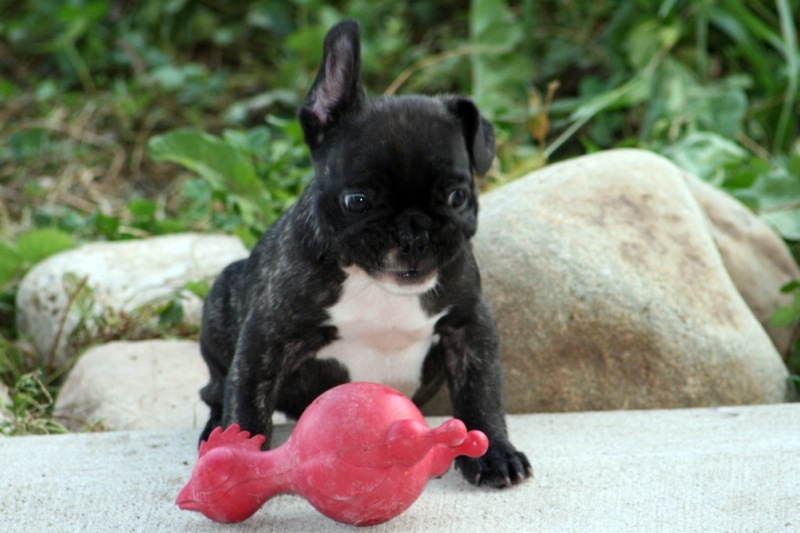 https://i0.wp.com/www.bullmarketfrogs.com/wp-content/uploads/2015/04/Brindle_pied_frenchbulldog.jpg?fit=662%2C662 662 662 Carol http://www.bullmarketfrogs.com/wp-content/uploads/2015/06/bullmarket-logo.png Carol2009-08-27 10:30:272009-08-27 10:30:27Eagles Impress Animal Lovers? Not this one. 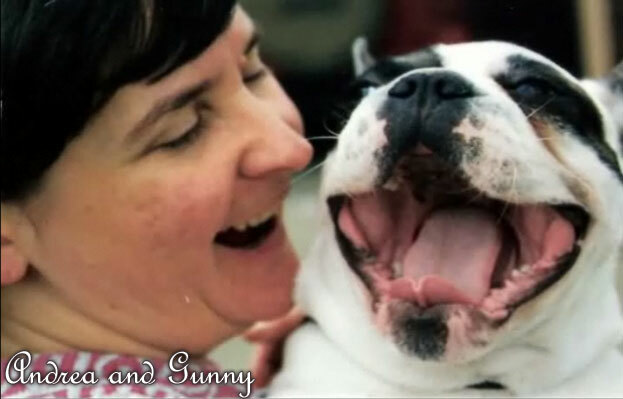 Andrea Morden-Moore, Gunny’s mom, has created a beautiful tribute video to his life. I’ve uploaded it onto Blip and converted it for viewing on line. It is a LARGE file, so it’s only going to be viewable if you’re on highspeed (or are very, very patient). It’s a lovely, touching tribute to a very special dog. Video after the cut, or on Blip. 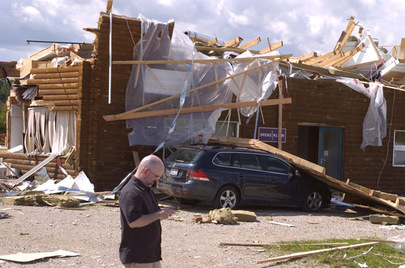 A destroyed building is seen Aug. 21, 2009 in Durham, Ont., where an 11-year-old boy died after taking cover from a storm under a wood-framed picnic shelter. I imagine a few people have tried to call after yesterday, but we are still without a phone. Thankfully, our internet is back up and working, although we had to tweak the satellite dish to get it working again. Our power came back on late last night, after hours of it being on and off. A class something or other tornado touched down about five minutes north of us, cutting a swath north east and then heading south into Vaughn. The tornado decimated most of the south end of Durham, knocking down buildings and snapping two hundred year old oak trees like they were twigs. We saw sections of aluminum siding embedded 100 feet up in a tree, and a car on its side in the middle of a pasture. It’s fairly surreal. I HAD to get to work this morning, but had to take a 20 minute detour. This took us down a road that had been hard hit. Massive trees down, barns decimated, fences thrown hundreds of feet. One local boy is dead, two others in critical condition, but otherwise limited injuries. Oddly enough, the only sign that Sean and I had that anything was seriously wrong, other than a thunderstorm, was that Petal and Sailor both went NUTS mid storm. Petal was yowling and screeching and hiding under the furniture, and Sailor was at the door barking frantically. The puppies were all scared, I imagine mostly from the lights being off. Thankfully, we have a good supply of emergency lights, so I sat with them and sang silly puppy songs. The worst damage we suffered personally was the wind threw our pool cover roller into the deep end… we’re feeling very lucky. Somehow I never pictured that this area would be at risk from a tornado. I guess I was wrong. Sean and I have offered our house for any pets that won’t be allowed into temporary shelters with their owners. The red cross is here, and every spare police man and fireman from the area. We’ve been declared an official disaster area, so hopefully things will get turned around shortly. They’ve told us we can hope for phone service as early as tomorrow morning, so fingers are crossed. I absolutely love finding ‘surprise’ photos on my camera. This one of Pickle is a perfect example – I swear that when I went to snap her photo, she was sitting there, looking cute and normal, and with both ears up where they always are. Apparently, it’s not just human kids who make stupid faces when you go take their pictures. Also, Pickle can apparently put her ears up and down at will. Surprise!